Manchester Friends of the Earth | How can I help bees where I live? How can I help bees where I live? You can also help our threatened bee population where you live – it’s surprisingly easy to attract, feed and provide a home for bees in a variety of ways. First of all, what do bees need to survive? Nectar and pollen of course, and preferably from a number of different types of flowers. You may well already have bee-friendly flowers at home, but, if you’d like to grow your own, wildflower seed mix is available from garden centres, as well as from Friends of the Earth as part of the Christmas Bee Saver Kit. If you’d like to order larger amounts of seed, we’ve had good results with a seed mix from Cotswold Seeds, but other suppliers are of course available. 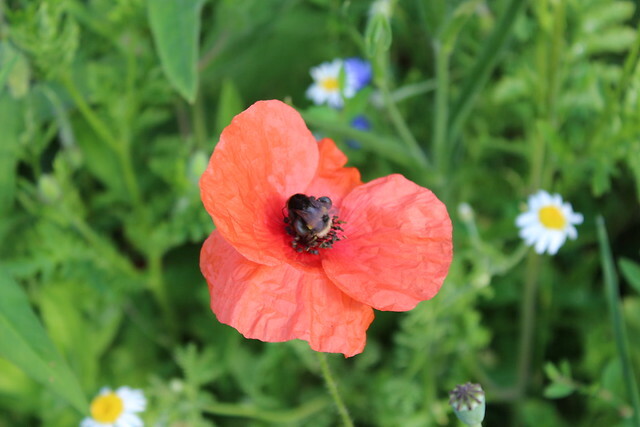 Our seed mix included the common field poppy (above), as well as 19 other types of wild flower. It doesn’t matter if you only have space for a window box (you can find out more here). You’ll still be able to grow more than enough flowers to attract a variety of bees, and there are always bees on the lookout for food even in the most urban environments. A few years ago, we had a nature stall in New Cathedral Street (next to the city centre Marks and Spencer) as part of the Dig The City event. Our pots of herbs attracted our first bee visitor within half an hour of setting up! If you’d like to choose your own varieties, wild flowers are not the only options. You can also get great results with vegetables, fruit and herbs. Exotic plants are often just as good as native species – if you’re happy with looking for plants by their scientific names, the Royal Horticultural Society have provided downloadable lists of suitable species. Make sure you choose single-flowered varieties, though, because bees find double flowers harder going in terms of getting to the nectar. Being bee-friendly is also value for money – you don’t need to think about which sort of fertilizer to buy, or check that the compost is peat-free. Wild flowers don’t need either compost or fertilizer (because they manage without both in the wild), and so long as you weed your flower patch thoroughly you should get great results. Sometimes one type of flower will crowd out the rest in the first summer, but if you keep your patch going for several years the diversity of flowers should keep on increasing and provide food for more varieties of bees – as well as hoverflies, butterflies and other pollinating insects. Bees also need somewhere to live, but if your garden doesn’t have many shrubs and trees or you only have a balcony, you can help them along by building a ‘Bee Hotel’. 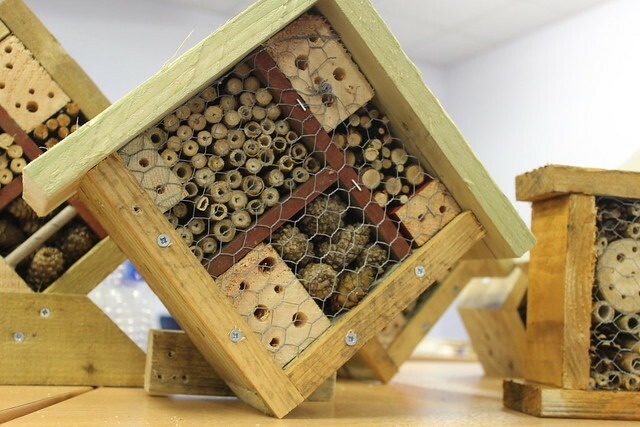 You can make a simple Bee Hotel out of bamboo canes and an old plastic bottle, and you’ll be able to attract even more species if you can get hold of sections of branches left over after a tree’s been pruned – just make sure they’re thick enough to drill holes in. Cones from evergreen trees are also great, and if you’ve ever made a bird box the same sort of structure (minus the front of course!) will make a sturdier Bee Hotel. You can find a full guide from Friends of the Earth about how to design and build your Bee Hotel, as well as where to put it once it’s finished.